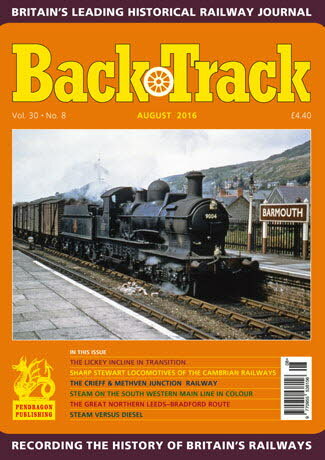 Railway Magazine | BackTrack August 2016 journal from Pendragon Publishing. Lingering in Leicestershire - colour spread by Tommy Tomalin on the Great Northern/London & North Western Joint Line. The Lickey Incline in Transition - Chris Fox reviews changing times on the Midland route over Britain's steepest main line gradient. Steam versus Diesel - a 1960s argument recalled by A. J. Mullay. The Sharp Stewart Locomotives of the Cambrian Railways - Part One of a Chronological Survey by John Reohorn. 'Dukedogs' on the Cambrian - a page of colour of this odd '90XX' Class of 4-4-0s. Focus on the Furness - four pages of archive photos of former Furness Railway lines. The Severn Tunnel - Nineteenth Century Aspects: Part Two - Jeffrey Wells concludes his account of the completion and opening of Britain's longest railway tunnel. The Crieff & Methven Junction Railway - a 150th anniversary celebration by Dave Ferguson. Western Region Permanent Way Diesel Shunters - a Colour-Rail photo feature. Bridges of the Newark and Bottesford branch - an East Midlands branch recalled by Michael Vanns. J. C. Bourne - Beverley Cole acknowledges the role of a noted early railway artist. The Great Northern Leeds–Bradford line - Alan Bailey shares his memories of the route from Wortley West Junction to Armley Moor and New Pudsey.